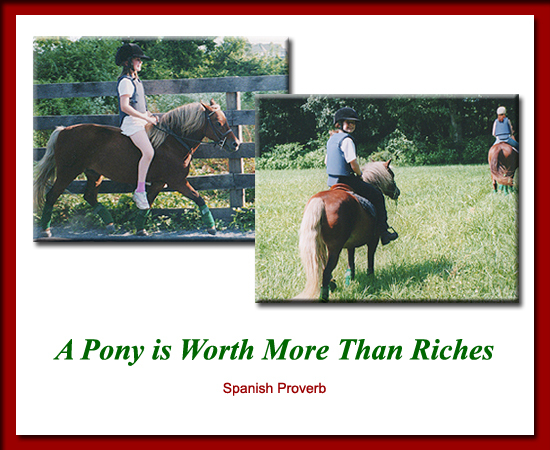 © Equine Therapy Associates: Meet the Ponies ! MEET THE PONIES! and Send Them an E-Mail! 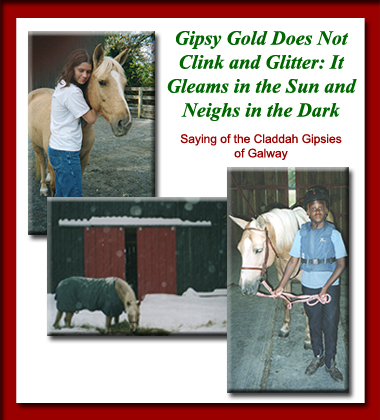 match her bright future, both in the show ring, and then as a guardian to young challenged riders. 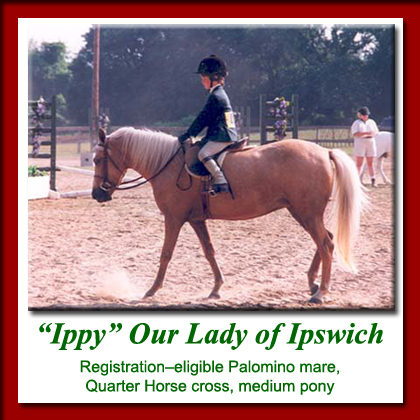 In her first therapy lessons, we couldn’t understand why Ippy stopped every time a rider reached over, crossed the midline, and tried to touch her toes! Stupefied, we finally realized that she was afraid her rider was falling, and wanted to protect her! All of us at ETA were prouder of that innate ability than we ever were of the Championship ribbons she won in Lead Line, showmanship, halter, and Challenged Rider classes -- because that ability couldn’t be taught, it came from the heart. 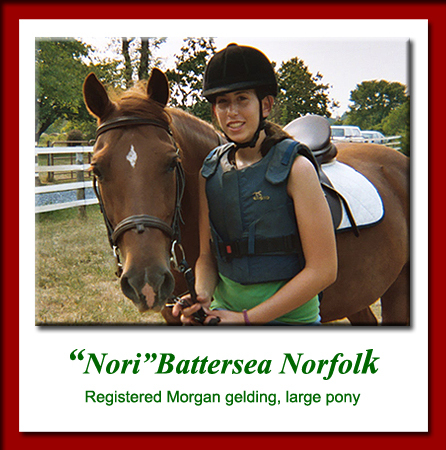 Battersea Norfolk was named National Therapy Horse of the Year by the American Morgan Horse Association in 2005. In 2006, North American Riding for the Handicapped chose him as their Region Two Therapy Horse of the Year and he was one of the eleven equines honored in the nation by NARHA. Burnished bright as a new penny, Norfolk is as spirited, bold, strong, and compelling as his ancestor and famous namesake, The Justin Morgan Horse. 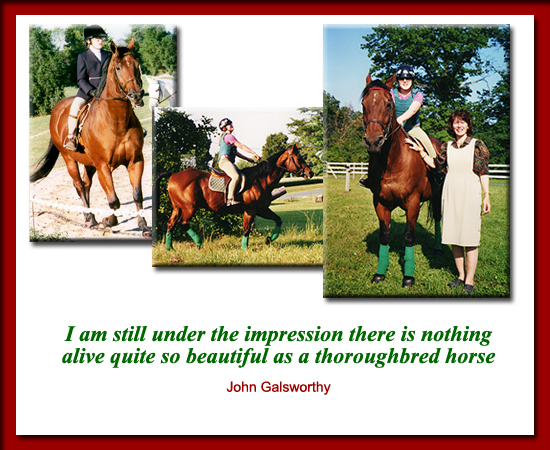 Initially trained as a driving horse, he didn’t have the drive and “death-wish” tenacity of a competitive driving horse, but ETA and our family didn’t need that anyway! Excelling in trail riding as a four year old with a 13 year old human, Nori came to EverGreen farm as a rather green five year old. He has since learned all about unsteady humans mounting him from a five foot staircase, and how to behave when Zaney corrects him for youthfully exuberant behavior. Norfolk's broad and strong back can carry 200 pounds, and his precise appreciation for 201 pounds versus 199 is indelibly demonstrated by a tossing head but willing body. Some of his riders dare not take an extra slice of cream pie on vacation! Norfolk’s physique is so classic that he wins in mixed breed halter classes, and his elegant head, huge brown eyes and mane and tail with threads of silver belie a spirit to challenge even an accomplished rider. Nevertheless, he willingly gallops cross-country in hand with a ten year old. After spending a year and a half patiently learning the basics of cavaletti and stride spacing, Norfolk now fluidly jumps two foot six inches, and carried one of our students three times to the Grand Championship in Prix Caprilli (a combination of dressage and jumping) at Special Olympics and the MD Challenged Rider Equestrian Trials. Norfolk stunned his family by carrying his rider to three trophies in his first visit to the Annual Handicapped Riders Division of the Devon Horse Show, arguarbly the most venerable and famous on the East Coast. 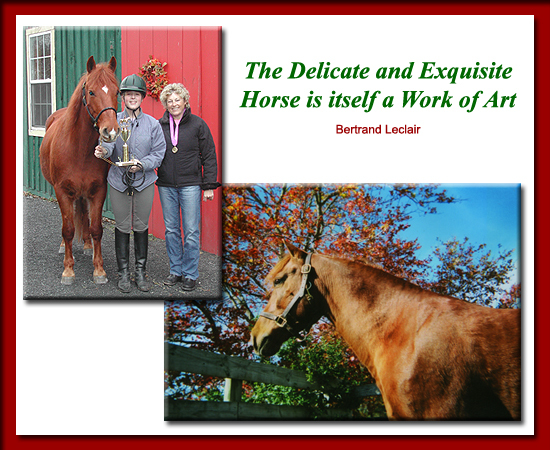 Elizabeth and Nori won three trophies, including the Stephanie Bennett Perpetual Trophy for the Advanced Division, the Anne Joyce Cochrane Trophy for the rider with the Highest Scoring Trail Class (out of 22 classes), and rode in the Hope Montgomery Perpetual Memorial Trophy in the Devon Oval for the Grand Championship. Nori is beginning serious work on his dressage, show jumping and cross country jumping in preparation for a new career in eventing. We need to keep his driving up as well. Norfolk needs continual conditioning beyond his normal therapy work, so he may be available for a ½ lease to a strong and talented rider. Alternately, one or two experienced volunteers with light hands can help us in his training program. Zaney has had five careers, but his true forte is therapeutic riding! 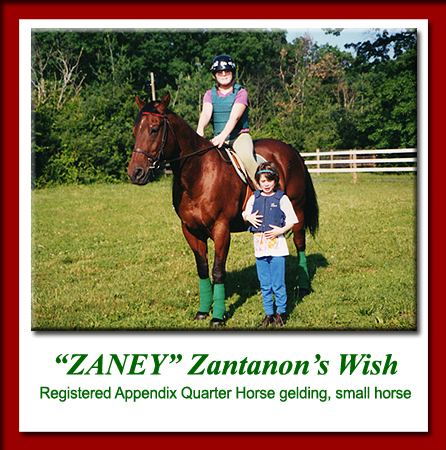 Sired by a thoroughbred stallion, out of a racing Quarter Horse mare, Zaney was too slow for the track. Sold soon after as a show horse, he was too interested in the equine “ladies,” and caused untold amusement in the audience, but drove the judges wild. His enthusiasm for life then dictated an ownership change, to a new family with a passionate fox chaser. Galloping past the Master of Fox Hounds repeatedly, a major social faux pas (he was too fast for this career! ), Zaney was regretfully retired quickly from this most exciting career. Zaney then excelled as a pleasure horse. Time and again, he safely returned his young owner home from trail rides, when illness made her so weak that she couldn’t pop the top of an aluminum Coke can. Purchased by our family as a protector for our 30 year old gelding Skooter, Zaney was our horse’s pasture companion for 11 years before he was trailered to the 14 feet of annual snow in northern Arizona, complete with wolves and bear as wilderness companions. Excelling as an endurance horse, he was tireless both in his love for trails as he was for cow elk, a herd of whom pastured each night just across his field fence. Returned to MD’s heat and humidity, Zaney has ably led his small herd into the barn from summer thunderstorms, stood in driving snows to guard them in fierce storms, yet reached down to let a small friend put on his fly mask in his last, but best, career – therapeutic riding. Albeit mostly-retired, Zaney is the finest therapy horse or pony I’ve ever seen: leaning left as a rider slid to the right, slowing down when a rider became unsteady, never putting a foot wrong no matter how a command is given. My husband says that he could have been a brilliant officer’s mount in any past war where a cavalry mount was needed – Alexander’s Bucephalous couldn’t hold a candle to his jumping! Zaney even helped rescue a lost polo pony, when most humans were convinced that he had expired in a summer’s drought. Zaney's long back has swayed, and he can only carry 100 pounds comfortably, so he needs friends to daily give him (carrot) physical therapy. Yet, his spirit is undimmed, and he reigns supremely over the barn and all he surveys. Wouldn’t you like to help give him P.T. regularly? Zaney needs regular volunteer help walking, hand-grazing, trotting over cavaletti in hand, and ground exercises to keep his back from dropping further. Leased by our family, this delightful powerhouse of purpose gave our daughter back her confidence after three falls in three days from three different equines! Owned by a talented lady rider and trainer of MD Hunt Cup winners, DooWop is a brilliant, champion driving pony, a fox chaser who once jumped three foot nine inches, and a four footed diplomat. Renowned for his level head, DooWop is swooned over by children at horse shows (“he’s so cute!”), and most endearing at home. A sturdy 500 pounds, this descendent of the brave Celtic and Norse crosses bred in the Shetland Islands could carry an adult man or work in the mines all day, but at EverGreen Farm he fights the “battle of the bulge” with the richness of our grass through a “Miracle Muzzle.” His fast-paced trots burn up the miles, but he will patiently stand (even when a mammoth horse fly lights on his back) if a young person is dismounting. 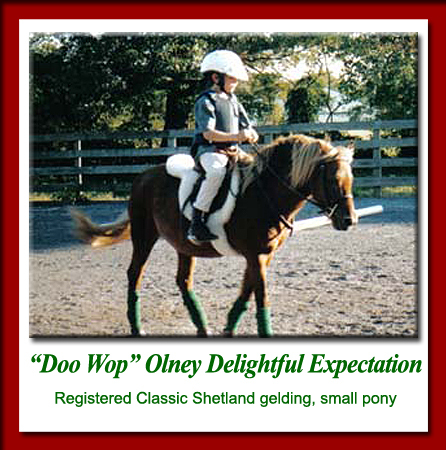 Doowop has won twelve Challanged Rider Reserve or Grand Championships along with numerous Special Olympics Medals and MCET Grand Championships. He even helped one special student win three Gold Medals at Special Olympics after only ten lessons! When DooWop first arrived Ippy deferred to him completely, although she out-weighed him half again, and stood six inches higher at the withers. Rightly recollecting that “authority” came in small packages (her dam was 10 hands high), this normally dominant mare let him eat her hay, her grain, and her carrots. She followed him around like a puppy dog for several weeks, and adored him. Today, older and wiser, she may put her ears back when she shares a hay course with him, but she will still push a particularly appetizing flake in his direction! DooWop gets along splendidly with everyone – human, equine, canine and feline. Endowed with a dappled, chocolate brown coat of lustrous thickness, DooWop sports a modified hunt clip much of the year to avoid over-heating. A heart of gold beats in his cuddly body! DooWop needs lots of grooming, hand-walking, and attention to keep his mind off of GRASS! We are driving him more as well, so he needs friends who would like to regularly saddle soap and oil his harness and tack, and polish the shiny brass on his harness, as well as keep his cart in tip-top condition.